Posted by RahulPosted on December 21, 2017 December 27, 2017 0 CommentsCategories Corporate Litigation-All In Way, RERA ConsultingTags arbitration clause in the builder-buyer agreement, file the complaint before RERA Authority, RERA Litigation, What is Arbitration Clause? It has been observed in the past that the builders now have started a practice to put themselves behind the veil of arbitration clause in the builder-buyer agreement and when any event of breach of contract occurs, the buyers remain sceptical about the effect of arbitration clause over the legal proceedings. To have an answer first we should know what is an arbitration clause and how it can impact the Builder-Buyer agreement. Arbitration clause in the agreement speaks about the resolution of the disputes through third party which is neutral rather than taking the matter further before the court, authority or forums. In other words, Arbitration clause allows the parties in dispute to submit the issue outside the jurisdiction of court and the final decision taken by the Arbitrator shall be binding on all the parties. Builder- Buyer’s agreement is a contract between the builder and buyer in which both the parties agrees on all the terms and conditions in relation to the particular project. In past few years it has been found that the builders with the mischievous intention to muddle on the money of innocent home-buyers incorporate this arbitration clause in the agreement so that in case if any dispute arises it should not slip out of their hand. 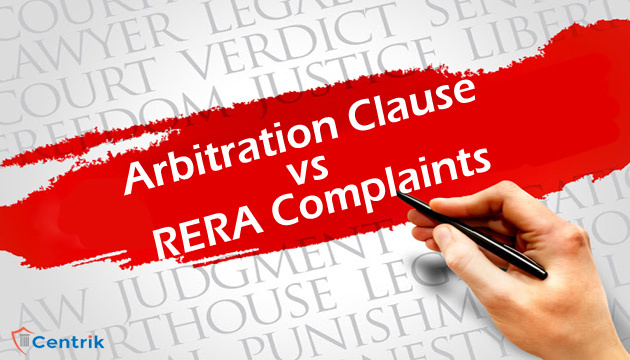 Now question arises, can a buyer be prevented from pursuing RERA litigation just on the basis of arbitration clause in the builder-buyer agreement? This was decided in the case between (Aftab Singh v/s Emaar MGF Land Limited) by NCDRC. The developer argued on the basis of amendment to the Arbitration Act, where in it was stated that if the parties to the dispute had already agreed to the go for the arbitration for their disputes then in that case a judicial authority shall refer the matter to the arbitration, if any of the parties’ files timely application. The Purchaser argued that the alteration in the provision of the Arbitration Act didn’t provide any prerogative to the arbitration clause to override Consumer Court jurisdiction and the enactment of the amendment in the act, was not to overrule the court judgements about the jurisdiction of the forums to decide such matters. The decision was taken by NCDRC on July 13, 2017 and it was decided that the matters like testamentary disputes, disputes relating to trusts, insolvency disputes, consumer disputes and disputes within the jurisdiction of the Real Estate Regulatory Authority set up under the Real Estate (Regulation and Development) Act, 2016 cannot be decided by the arbitration as there is involvement of huge public interest, therefore the power of special courts or forums cannot be supersede by arbitration clause in the agreement. Note: The same matter was taken further to the Hon’ble High Court and it was pronounced on November 07,2017 that the High Court is not the appropriate court to make an appeal against the order of NCDRC. As per Section 23 of the Consumer Protection Act such appeal shall lie before the Supreme Court. In the light of above we can reach to the outcome that even though there is a presence of arbitration clause in the builder-buyer agreement but mere existence of this clause cannot restrict any buyer to file the complaint before RERA Authority. Note – Please note that the above article is for education purpose only. This is based on our interpretation of laws which may differ person to person. Readers are expected to verify the facts and laws.